JOE CHEVALIER, second from left, shown at a Larchmont Boulevard Association prize ceremony. When Rene’s Rental Library on Beverly Blvd., just east of Larchmont (next to the corner drug store) was sold, books were renting for three cents a day. That was in 1939, and new owners Joe Chevalier and his wife moved in and maintained the same rental rate, but changed the name to Chevalier’s Book Store. 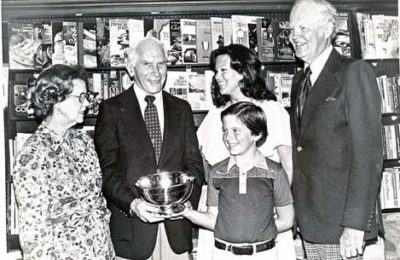 This month Chevalier’s celebrates its 45th anniversary in Larchmont Village with distinguished, silver-haired Joe Chevalier still at the helm, buying books and overseeing the daily operations of the store. Chevalier’s first wife, Marguerite, who died in 1953, opened the shop to combat housewifely boredom. At the time, Joe was working for Carnation Co. and helping his wife out at the store on the side. In 1945 Joe came into the business, which was steadily growing, on a full-time basis. By then the bookstore had moved to new quarters at 239 N. Larchmont Blvd., where the Crocker Bank parking lot now stands. The store had expanded to include books for sale, stationery and greeting cards, and in the back, an art gallery featuring one-man shows. A native of Los Angeles, Chevalier was born just two miles from Larchmont. He graduated from Loyola High School and Los Angeles City College. Rosalie, his wife of 25 years, grew up on Manhattan Place. For 40 years Chevalier lived on Windsor Blvd., four blocks from the shop. Eventually, Joe and Rosalie moved their books and cards to 126 N. Larchmont Blvd., the current location. Although the neighborhood bookstore has felt the impact of the discount booksellers, it offers something the discounters do not—personalized service and a willingness to spend time tracking down hard-to-find books. Recently a customer who moved away 10 years ago called Chevalier’s from Berkeley looking for an etiquette book for her teenage son. Chevalier’s spent over 20 minutes on the phone, calling libraries searching for the right book, which was eventually found. “You won’t find that kind of service at Crown, I imagine,” said Chevalier. The famous and the infamous have bought their books from Joe Chevalier. When Howard Hughes lived on Muirfield Rd., he sent a man over regularly to buy books. One day he decided to check out the store himself. Chevalier had been told not to talk to Hughes, but after watching him stand in front of the non-fiction shelves for 20 minutes, Joe couldn’t stop himself. “May I help you?” he asked. “Nope,” said Hughes. Hughes left and never returned. Author Aldous Huxley and his wife Maria were regular customers, and brought in many a Britisher to buy from Chevalier. One such visitor was Dame Edith Sitwell, poet and critic, who arrived in an MG sportscar from which she could not extract her rather large bulk. Joe talked with her in the alley behind the store, while Dame Edith remained seated. Other famous customers included Nelson Eddy, who bought dollar greeting cards in boxes—an extravagance then, and Nat King Cole, who Chevalier described as a discerning reader and real family man, often arriving with a child in tow. Although he does not admit to any particular favorite book or author, Chevalier has collected some rare books in his many years in the business. He owns several first editions of the works of John Steinbeck. “Grapes of Wrath” was on the bestseller list when Chevalier’s first opened for business. He also owns a volume of the works of Rabelais, which was the first to be printed in English. He and Rosalie attend the Antiquarian Book Fairs in San Diego and Los Angeles, often running into the Dawson brothers from up the boulevard. He is a former president of the Southern California Booksellers Assoc., and a director of the Larchmont Boulevard Association. Chevalier’s began its 45th year on Oct. 15 (1984), giving the residents of the area a reason to celebrate. As the boulevard and its shops have changed over the years, Joe and Rosalie Chevalier have continued to offer a center of stability, a store offering classics and contemporary literature, friendly, personalized service and books to rent as Larchmontians did 45 years ago.